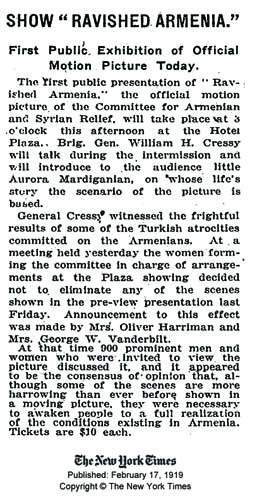 вЂњRavished ArmeniaвЂќ, one of the first documentary memoirs of an eyewitness of Armenian Genocide was published in 1918, in New York. 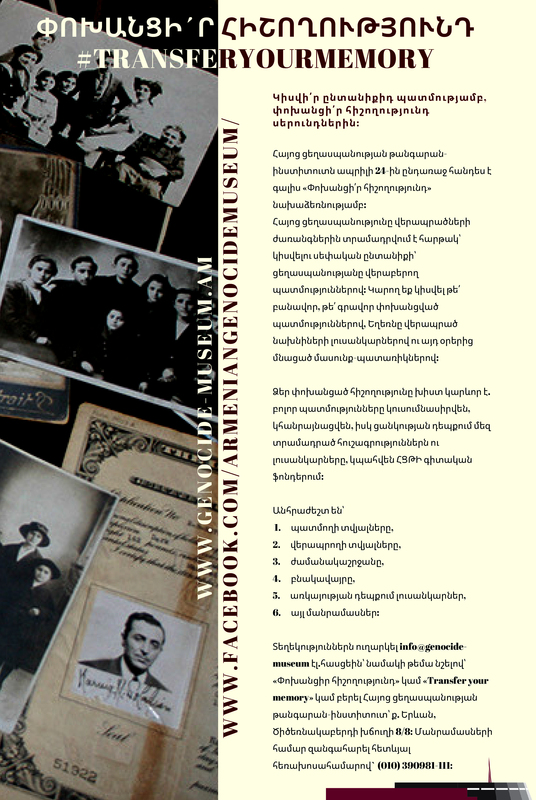 In this book Arshaluys (Aurora) Mardiganian, a girl from Chmshkatsag, Armenian populated town in the Ottoman Empire, gave a detailed account of the terrible experiences she endured during the genocide. At the age of fourteen Arshaluys was beaten and tortured in harems of Turkish officials and Kurdish tribesmen. The most traumatic of all, though, was the fact that she lost her parents, sisters and three brothers who were viciously killed in front of her eyes. After two years of those horrors Arshaluys Mardiganian, or Armenian Janna dвЂ™Ark, as she was called in America, resisted the conversion of her faith, escaped from the harem of Kemal Efendi, her Turkish lord. In the beginning of spring in 1917, after long-lasting wandering she reached Erzrum, which had already been occupied by Russian forces. There Arshaluys was sheltered by American missionaries. Later by the help of Armenian National Union and American Committee for Armenian and Syrian Relief she moved to Peterograd, Russia, then to New York USA and settled there. Despite all the sufferings Mardiganian stayed unbending. 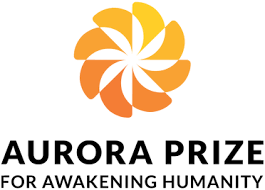 She had a mission to tell the world about the atrocities committed against Armenians in Turkey. 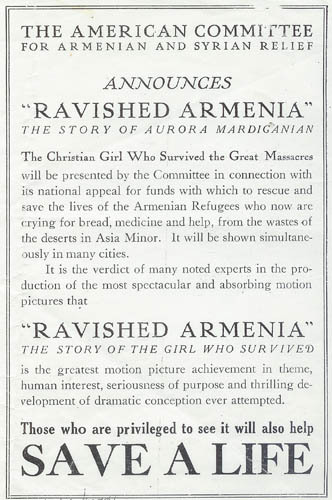 The book вЂњRavished ArmeniaвЂќ was completed when American Committee for Armenian and Syrian Relief offered to create a film based on the scenario of the book. It was agreed that all the profit which reached $30 million would be given for relief purposes of 60.000 Armenian orphans gathered in the Near East. In 1918, at Metro Goldwin Mayer studio, director Oscar Apfel made a silent film вЂњAuction of SoulsвЂќ, which actually became the first genocide movie ever made. 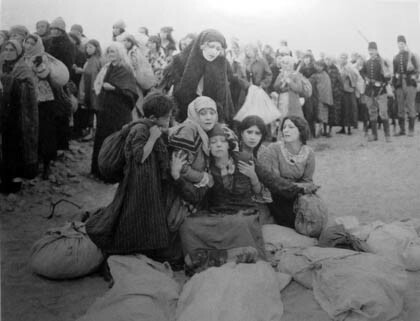 More than 10.000 Armenian residents of Southern California, including 200 deported children, participated in the scenes. The script of the film had 3 versions. First version consisted of 675 frames, and the last, restored one вЂ“ 531. 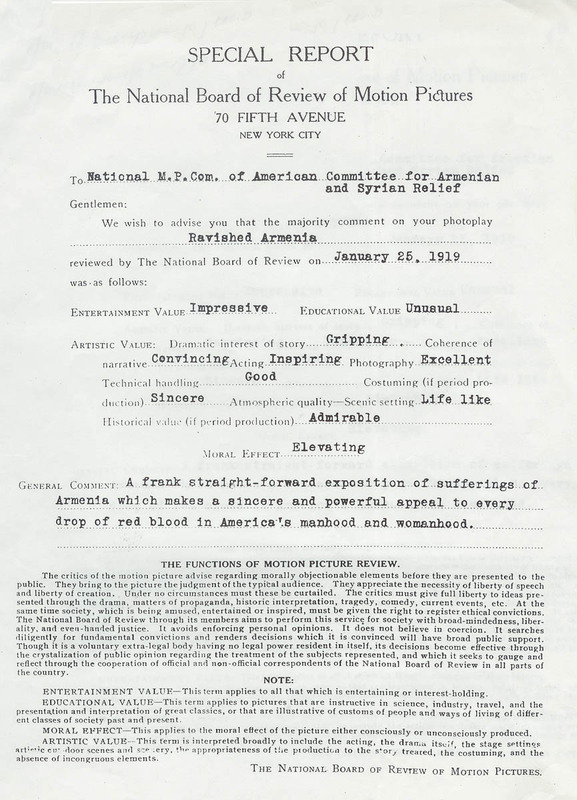 The frames were investigated by Viscount James Bryce, the President of American Committee for Armenian and Syrian Relief, former ambassador of Great Britain to USA and Henry Morgenthau, American ambassador to Turkey, from 1913 to 1916. All gentlemen gave high appraisal to all the frames. The film is especially remarkable due to the fact that Arshaluys Mardiganian was the author of the scenario as well as played the leading role. Her input regarding the accuracy of the costumes, characters, settings and backgrounds was incredible. Oscar Apfel the director of the film took into consideration the great political importance of the film and chose Mardiganian to play the leading role. 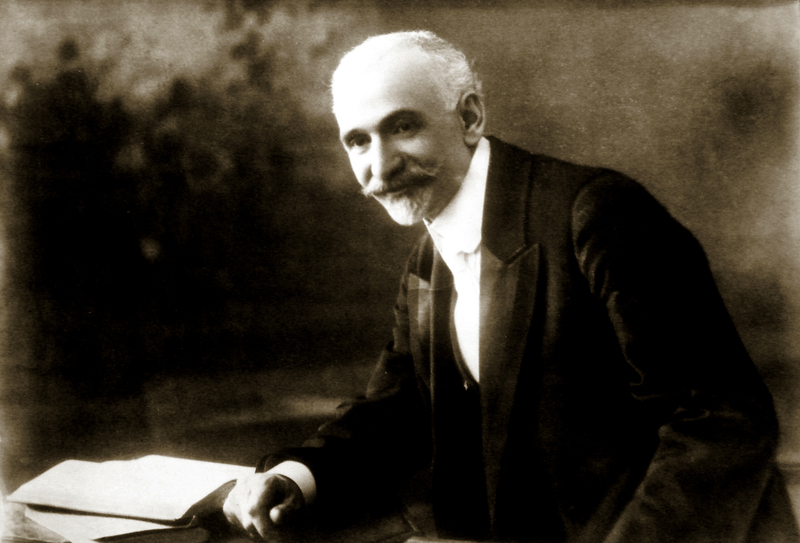 Apfel was convinced that MariganianвЂ™s participation would be appealing not only to one nation, but for entire humanity. The American National Motion Picture Committee officially licensed the film before the premiere. 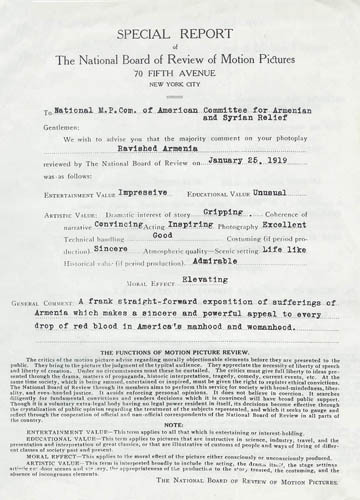 In its report to the American Committee for Armenian and Syrian Relief of January 25, 1919, the ANMPC stated that the film was not only of artistic, historical, educational and informational value, but вЂњit represented the sufferings of Armenians, which would leave a deep impression on each representative of American societyвЂќ. 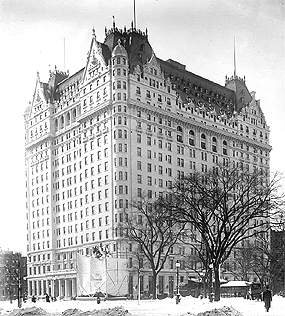 The premiere of the вЂњAuction of SoulsвЂќ was held on February 16, 1919, in Plaza Hotel, New York under the auspices of Oliver Harriman and George Vanderbilt, members of American Committee for Armenian and Syrian Relief. 7000 prominent New Yorkers attended the premiere at a ticket price of $10). The movie played for a week and the gains were sent to The Near East Relief. In large cities as New York, San Francisco, and Los Angeles is Mardiganian held meetings with representatives of upper ten talking about the brutal atrocities of the Turks. Apfel in his turn held meeting with public and said that вЂњAuction of SoulsвЂќ was the fatal claim of Armenia to American people, and he approached to each event with extreme caution. Apfel also confessed that several scenes of the film were eliminated, as they were horrifying. One of the torture scenes in the film revealed an elderly clergyman whose fingernails were pulled out with tweezers. Apfel was against the omission of any harrowing scenes from the public showing of the film, as the falsifying of facts was even more dreadful. The film was shown in large cities of 13 U.S. states, in several countries of Latin America, including Mexico and Cuba. It was a success everywhere and was estimated as вЂњepoch-making filmвЂќ. 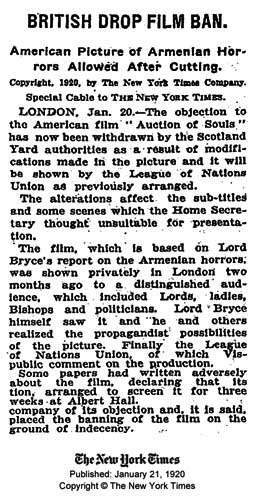 In 1919-1920 London вЂњBayoscopвЂќ, newspaper dedicated to motion picture arts published in wrote about the great importance of вЂќAuction of SoulsвЂќ. Popular newspapers like вЂњThe Illustrated London NewsвЂќ, вЂњThe Morning TelegraphвЂќ mentioned that every person should see the film. 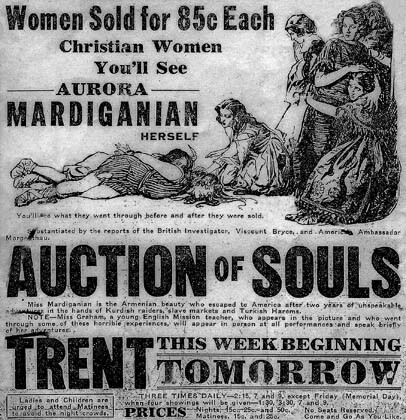 The вЂњAuction of SoulsвЂќ was taken to Great Britain in December, 1919, and censured. After long lasting negotiations the film was shown in Royal Albert Hall, by the permission of Scotland Yard and played for three weeks. Then it was censured again, some headlines were changed, four scenes were eliminated after which the film continued playing. 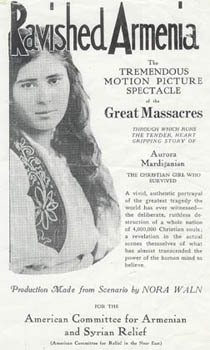 At the beginning of 1920s MardiganianвЂ™s вЂњRavished ArmeniaвЂќ was censured and taken off the British and American libraries. 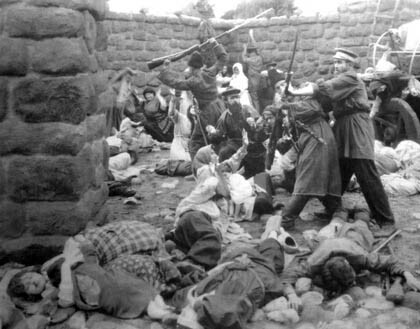 For over eighty years film historians have been searching the world for the nine reels of Ravished Armenia but failed to find any trace. The remaining reels of the rare nitrate based film were lost. Some say the reels presumably sunk with a ship on their way to the port of Batoum, or stolen by thieves. The full-length version of the film, which lasting 85 minutes, unfortunately, hasnвЂ™t been saved. With the efforts of Eduard Gozanlian, an Armenian from Argentina, a segment from the reel was found in 1994. One copy of that segment is kept in the funds of Armenian Genocide Museum-Institute. The film included English, French and Armenian subtitles for every scene. 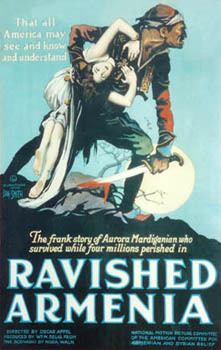 The list of the original subtitles for Ravished Armenia is preserved in The Selig Collection at the Margaret Herrick Library of the Academy of Motion Picture Arts and Sciences. They are also reproduced in Anthony SlideвЂ™s book "Ravished Armenia and the Story of Aurora Mardiganian". This book was published by Scarecrow Press in 1997. It tells the story of the making of the film and reveals the young girl's survival story.